February 2011: Clinical trial was initiated (click for press release) comparing weekly self-administration at home with the autoinjector with several doses compared to intramuscular needle-and-syringe administration by healthcare provider at office. I do not see a clinicaltrials.gov listing for this trial. 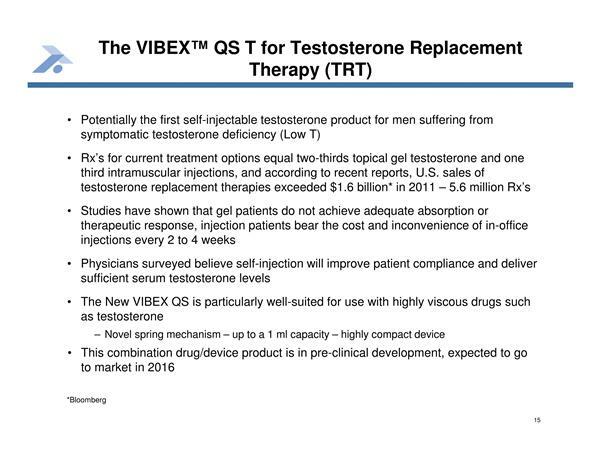 3/14/11 CC: data from this trial is expected late 3q2011 (agreed to design w/ FDA input. Look at PK in RA pts plus usability studies. No large p3 trial for efficacy needed). 4/5/11 at Needham and 5/9/11 1q11 CC- trial is enrolling ahead of schedule- validating interest from physicians, "quite complicated pivotal clinical PK study"
5/9/11 CC: Just in the process of completing primary clinical trial now a couple months ahead of schedule (one site had 10 pts ready to go before IND was cleared), data summer 2011. 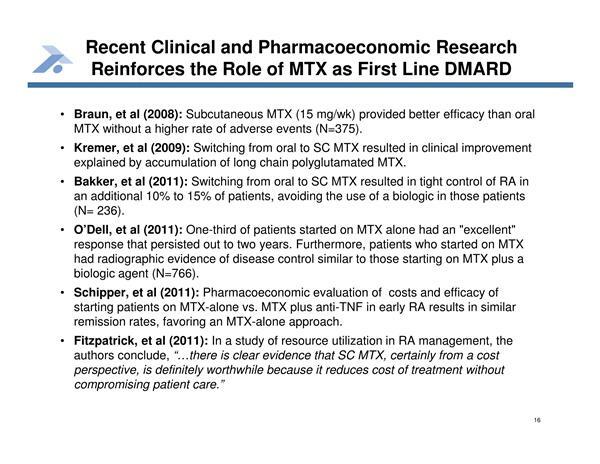 Show that use of Vibex MTX shows PK behavior that is appropriate for treatment of RA pts and compare to other dosage forms. Have not disclosed # of pts in trial due to competitive reasons. Then meet w/ fda before filing NDA 1q2012. 3/11 at Cowen and reiterate 5/9/11 1q11 CC: NDA is projected to be filed in 1h2012, product launch would be 2013 (3/14/11 4q10 CC- similar timeline in Canada). Program cost will be substantially less than the Anturol program (spent $0.7m on MTX in 2010). 11/2010 and 1q2011 10q: said will spend <$2m in 2011 ($0.47m in 1q11). Combination of existing drug with new device generates an attractive return on investment (ROI). 4/5/11 at Needham: not trying to compete with oral dosing- target pts who can't take orally (injectable use has grown from 4% to 8% and believe could go up to 15% of pts). In Europe, prefilled syringe MTX product is available- sells 3/4 of the $80m in MTX in Germany (attractive volume-value proposition0 only has 14% of prescriptions). Pricing $40-50 (per what?) total EU mkt is $150m for prefilled syringe, but pts prefer autoinjector. One of AIS MTX trials is using needle and syringe for comparison to monitor this.